A Museum Exhibit Devoted to Italian Fashion History? Yes, Please! 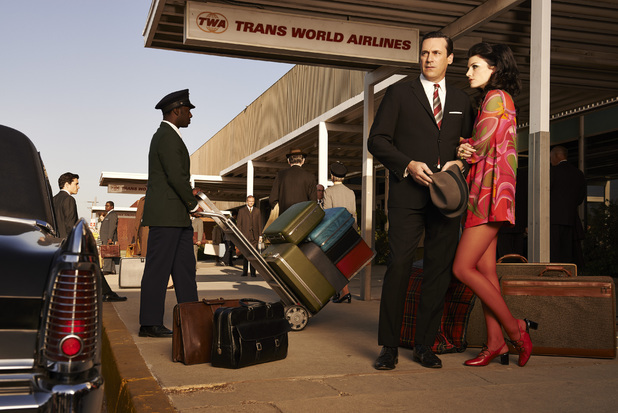 Lusting after Megan Draper’s Pucci outfits on Mad Men? Jodie Foster’s killer Armani tailored pantsuits? The classic black-and-white vintage Valentino Julia Roberts wore to pick up her 2001 Oscar, or the glorious blue chiffon Prada Lupita N’yongo chose for this year’s ceremony? For decades, Italian fashion has been a byword for using the best fabrics and superb tailoring to create an irresistible combination of elegance and sexiness. It’s all on display in an exhibition at London’s Victoria & Albert museum called “The Glamour of Italian Fashion 1945-2014” that showcases over 100 ensembles by leading Italian fashion houses, from the unapologetic glitz of Versace, Roberto Cavalli, and Dolce & Gabbana to the austere architectural tailoring of Ferré and Roberto Capucci, as well as next-gen Italian fashion talent. There are also accessories including Ferragamo shoes created for Audrey Hepburn and a blingtastic Bulgari emerald-and-diamond necklace from the collection of (who else?) Elizabeth Taylor. Brava! Click through the gallery for a sneak peek of the exhibit! This structured pink-and-green silk evening gown is from the designer's 1987-1988 collection. Capucci is known for his architectural designs. This tropical print dress is from Pino Lancetti's 1976 collection. The "Made in Italy" marketing campaign came about as a way to celebrate the array of luxury products in Italy and to establish Italian-made goods as being the epitome of style. Tailoring is a very important aspect of Italian fashion. "A well-tailored suit requires precisely cut fabric and exact fit, along with fine finishing details. The smallest design elements, such as the shape of a pocket or sleeve, often differed from region to region. A Neapolitan suit could be distinguished from one produced in Rome," the Victoria and Albert Museum says on their website. From right to left: Men's herringbone suit, Carlo Palazzi, 1970; men's wool coat, Carlo Palazzi, Autumn/Winter 1969/1970; men's jacket and sweater, Ermenegildo Zegna, 1970; women's coat and dress, Andre Laug, 1960; and men's double breasted suit, Brioni, 1947. This embroidered evening dress and coat are from the label's 1966 collection. From his Spring/Summer 2014 collection, this blue palm-tree print minidress and matching bomber jacket are part of the most modern section of the exhibit. Alongside the emerald-and-diamond Bulgari necklace from Elizabeth Taylor's collection is a photo of the star wearing it at a masked ball at the Hotel Ca' Rezzonico in Venice in 1967. From the label's Spring/Summer 2001 collection, these stiletto ankle boots are made of black leather and feature gold, white, and pink embroidery. This silk and net evening dress is from the designer's Autumn/Winter 2013/2014 collection.